One of the core principles of Azure is customer choice, and when it comes to running containers in production the Azure Container Service (ACS) offers a choice of best-of-breed open source container orchestrators, all supporting the Docker image format as well as popular tools and APIs. You can install and run these orchestrators using Azure Virtual Machines, but we think you’ll find Azure Container Service a much better choice. The Azure Container Service, currently in public preview, offers a choice of open source solutions for container orchestration either Mesosphere’s Marathon (with Apache Mesos) or Docker Swarm. 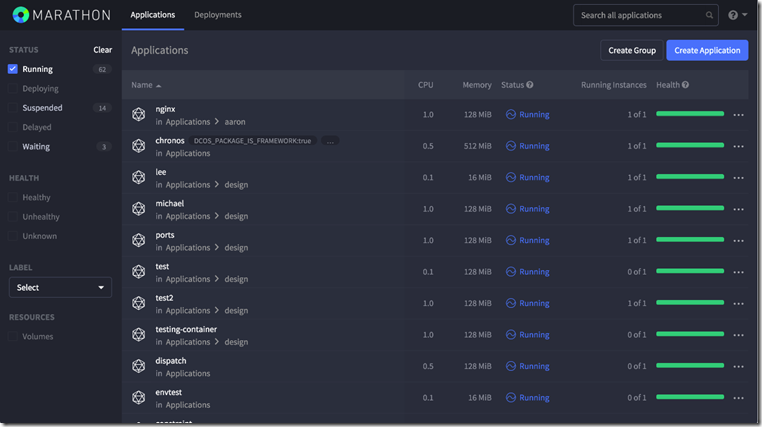 Today we’re highlighting Mesosphere’s Marathon, which just reached its version 1.0 milestone and is part of Mesosphere’s Datacenter Operating System (DCOS). Marathon 1.0 integrates with Apache Mesos on the Azure Container Service to deliver a complete enterprise-grade solution for container orchestration. The version 1.0 milestone recognizes Marathon’s production-readiness after years of development and significant technical enhancements, installed at many large enterprises, running a wide variety of workloads. Application groups and dependencies: Users can organize containers into “pods” of related components. For example, you can group together your microservice and its backing database, and control their lifecycle and scaling as a single unit. Users can also declare the relationships between application components, and Marathon will ensure they're started in the correct order and that an invalid deployment is never allowed. Rolling upgrades for zero downtime : Users can control exactly how they'd like Marathon to roll out upgrades to their applications and services, using progressive rollouts, health checks, and rollbacks to ensure zero downtime and high availability. Simple but powerful UI: The Marathon user interface makes it easy to deploy, manage and scale your containers with a few clicks. Because Marathon can run on almost any infrastructure platform, users get the same experience whether running on Azure VMs, Azure Container Service or their private data centers.